If you're in need of a crown to cover a damaged tooth, you have a lot of options. But before you choose, you need to know what you want. Would you be happy with an affordable, well-fitting crown that holds up well and allows you to chew comfortably? Or are you interested in a more expensive one that also provides the most attractive result? Crowns have been a mainstay in dentistry for generations. The first were made of metals like gold or silver — durable and effective but not very attractive. In time, a ceramic material known as dental porcelain began to make its appearance in crowns. Dental porcelain could be fashioned to resemble the color and texture of natural teeth, but it had a significant drawback: it could be brittle and subject to shattering under chewing pressure. This problem was somewhat addressed with the innovation of a crown with a metal substructure fused with an outer layer of porcelain. 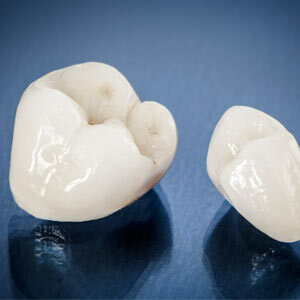 These porcelain-fused-to-metal (PFM) crowns combined the best advantages of both materials: strength and life-likeness. Up until around the mid-2000s, PFM made up over 80% of crowns. But later porcelains continued to improve in strength, beginning in 1993 with the introduction of a Lucite-reinforced material. Newer formulations like lithium disilicate or zirconium oxide (now considered the strongest porcelain) have made all-porcelain crowns a viable option. Today, an estimated 60% of new crowns are all-porcelain. From an appearance standpoint, all-porcelain crowns achieve the best results. The most realistic crown can be costly — not because of the material but the level of artistry required. A skilled dental technician will spend several hours, including brushing on as many as fifteen coats of liquid porcelain to the crown, to achieve the most life-like outcome. Your insurance plan, if you have one, will most likely not pay as high a percentage for that type of crown. In the end, it's your decision as to what type of crown you wish to have. We'll help you weigh your options and decide what's best for you and your budget. If you would like more information on crown options, please contact us or schedule an appointment for a consultation.